Artist, entertainer, translator, tribute artist, and ETA judge, Marcus Wells, pictured with his wife Karen at Sandra Gold's birthday party, January, 2018. Photo Credit: Carolyn MacArthur. In celebration of Marcus Wells’ birthday on April 11th, I am pleased to post his interview as a special gift to him. 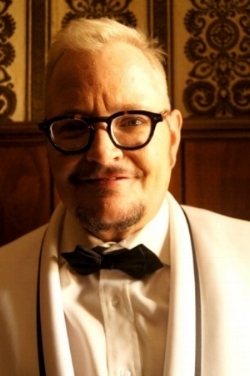 But this post is also a gift to SIDEBURNS readers, since I know they will enjoy reading about Marcus Wells’ interesting life as an artist, entertainer, translator, tribute artist and ETA judge. His answers are humorous, sincere, entertaining, and like his artwork, colourful. Marcus Wells and Carolyn MacArthur after his Casablanca show in 2016. Photo Credit: C.M. I had the pleasure of meeting Marcus for the first time, two years ago, in October 2016, when he appeared as Elton John at a show that included famed ETA, Gordon Hendricks. When I asked if I might have my photo taken with him, Marcus seemed genuinely pleased and a little surprised, since everyone else was scrambling to take photos of Gordon. This event was long before SIDEBURNS, so my knowledge of who’s who in ETA land was limited. I knew nothing about Marcus and his history in the tribute business. I did know, however, that I had just enjoyed a splendid performance and I wanted a keepsake of the artist who looked and sounded so much like Elton John. A year later our paths would cross again, this time at the Flaming Star Festival, in October 2017. When Marcus walked into the competition room, I said to my daughter with surprise, “I think we know the fellow in the bright red jacket. Isn’t he the artist who did an Elton John tribute at Casablanca?” Indeed, it was one in the same; but this time he wasn’t performing: Marcus Wells was one of the judges. When I had a chance to speak to Marcus and retell the story of our first meeting, he said he remembered me asking for his photo. I have since seen Marcus Wells at shows where his friends were performing and at a birthday party where, to my delight, Marcus sang David Bowie's "Let's Dance". Marcus is a fun-loving, story-telling individual with a great sense of humour and a bright outlook on life. I appreciate the wonderful answers he gave which I am pleased to share with you. Thank you, Marcus, and happy birthday! Best regards, Carolyn. Q. Tell us five interesting things about your early life in Montreal. Marcus Wells, Flamboro Downs, March 16th, 2018. Photo Credit: C.M. A. Let’s see…I lived through some pretty interesting historical events. I have a sharp memory of the October crisis and the War Measures Act being established in Montreal in response. My parents took me for a drive downtown and there were armed soldiers everywhere. Scary, but for the 5-year old that I was, it was fascinating. I also have very cool memories of Expo 67. It was a magical time, and to this day, I collect Expo 67 memorabilia. The Olympics in 1976 were also a great time. That year, school ended early for the occasion… June 4th. I still remember the date! A couple more interesting things would be that I did not really speak English until I moved to Toronto at age 21, and that my friends and I (like most little Montrealers from the 70s) all pretty much started secretly smoking at age 11. How horrible is that!? Luckily, I kicked that deadly habit…eventually. Q. Describe your life as a teenager. A. I had wonderful friends, many of whom I am still in touch with. I was a bit of a square peg. My friends were super cool – new wave, punk - and here I was, looking like them (oh yes, spikey hair, a diaper pin as an earring, studded dog collar – yup! ), but secretly listening to Helen Reddy and Elvis. High school was particularly awesome, but not academically. I really, really, really neglected my studies: I was having too much fun. In retrospect, I now realize that I was not being lazy, I was “honing my social skills”. Hey, it paid off in the end! Q. Please tell us about your post-secondary education. A. I took a one-year break after high school, not the best idea, and later went back to school at a graphic design studio where I got my degree in Graphic Design. My year was the last year where we actually did graphic design on paper and board, with actual pencils and stuff. I missed the computer graphics by one little year, which changed everything for me and pretty much made my degree useless. Many years later, I went to York University’s Glendon College in the translation program. Q. What are some of the more unusual jobs have you had in the past? A. I have had a GREAT collection of unusual jobs! My first job was in a commercial laundry in a run-down area of Montréal. It was 120°F all day long, during the summer, and I felt that no matter where life led me, I would never again have to work in such a horrible environment again! I never have. My oddest job, by far, was working as a cleaner-upper at the Maple Leaf Gardens shortly after I arrived in Toronto. I got to see the end of all these great shows and then help clean-up the place. I also owned a store/bakery (and so was a baker). I folded newspaper inserts (and got fired for having too much fun doing so). I was a taxi dispatcher, and I was a door-to-door canvasser for Greenpeace…many things! Q. What can tell us about Charles Frappier and Associates Inc.? A. The beginnings of CF&A (that’s what I call the company) were scary for me, but ultimately, the best thing ever. I was senior translator for the largest telecom in Canada and decided to strike out on my own. This was 21 years ago and I will never regret taking that intimidating step. Today, I have a fairly large clientele of faithful customers and I love my job! Translation is great because you never work on the same subject matter, it keeps your mind razor sharp, and, sometimes, you get to see your work in billboards, on TV, etc…mini stardom! Q. Did you take any lessons related to the performing arts? Please explain. Marcus Wells, as Elton John, on stage for a final bow and photo opt at the Casablanca Winery, 2016. Photo Credit: C.M. A. My mom forced me into classical violin lessons at age 3. I used to sob on my way there. My teacher was a nun who was, let’s say, less than warm-hearted. I stuck it out until I was 12. I didn’t appreciate the classical training until many years later. I deeply love classical music now. I also took some classical guitar lessons, which gave me just enough skills to be able to play Elvis music, which was all I wanted to do. Q. What music was most often heard in your home? A. My parents were classical and opera aficionados. There was a lot of that…until my cool friend Lisa and her sister Carole (best babysitter I ever had!) introduced me to the Beatles. Mom and Dad let me play Beatles albums, but Dad always made a point of making fun of them (in a funny, gentle way). And of course, Mom and Dad loved awesome mid-century orchestral instrumentals – Bert Kaempfert, James Last, Brazil 66… I still love that “muzak”! Q. Were you a performer prior to becoming an ETA? In what capacity? A. Yes! But when I became an ETA, I had not performed in several years. Before that, I wrote a lot of crappy music and performed locally. I had a little band in high school. We were called “Flash” (such a dated name now!) and we played Supertramp (which I loved) and the Rolling Stones (which I didn’t like, then or now). Q. Was performing full time as an ETA a career option you wanted to pursue? A. Of course, I toyed with that idea, but the reality of a performer’s career was not something that I could integrate into my life. First, there was my “real job” forcing me to stay put, and then my son was born about 2 years following my first foray into the ETA world, another great reason to not want to spend life on the road! Q. Describe what you were feeling before, during, and after your first performance as an ETA. A. Incredible stage fright! For my first show, I worked for months on a collection of favourite Elvis tunes, reserved the “party room” at my friend’s condo building, rented sound equipment and invited everyone I knew! In retrospect, it was all pretty dismal, but I was so happy to finally be doing this! There is no feeling like putting on a jumpsuit, officially, for the first time! Makes you feel like Superman! Q. Did you enter any ETA competitions? Where and when? A. My first competition was Collingwood, either 2000 or 2001. 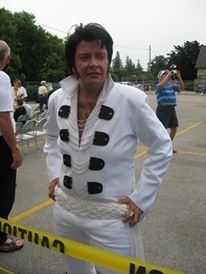 Comps were few and far between in those days: there was Collingwood and Brantford Elvis Fest, which used to be a fantastic event also. SO much fun! Q. Describe the process of turning yourself into a stage-ready performer. A. If you don’t mind, I’ll answer this in a more general way: The process would take place, for me, over the span of several months before a big competition. It was very exhausting and very comprehensive! Months before Collingwood, there were always the weight-loss attempts, constant vocal training, selecting and buying a new suit, and actual exercising. It’s a hard task to transform from an average guy to the amazing looking, incredibly charismatic and unbelievably talented performer that Elvis was! Pro tip: If you’re an ETA and do not wear make-up, you should. Don’t over do it, but you can always tell the pros because they know how important it is to wear make-up. Q. Describe how you felt before, during, and after your first competition. Did you achieve the outcome you desired? ETA Marcus Wells at Collingwood. Photo provided by M. Wells. A. This is actually quite funny. Before I entered Collingwood, I had never been there for the festival as a spectator since we were always away for that period of the summer. I did NOT do my homework at all, and I really thought that Collingwood was basically a parade and hanging out with ETAs. I thought (don’t laugh) that the judging was like in the movie Flashdance. I thought you went into a classroom kind of place and performed alone in front of a judging panel. Imagine my surprise when I found out that I would be competing in an ARENA with 1500 people in attendance! I had a bad suit and I was petrified. I went up on stage, spoke about the suit interminably and sang “Trilogy” without moving a single muscle. It did not end well. Q. What is the biggest mistake that young ETAs make in their tribute? A. I have been judging a lot of Elvis competitions over the last decade or so, and I can say that the main issue is that the younger generation of ETAs is straying further and further away from what Elvis actually was. It seems that the young guys have created a new version of Elvis, more vibrant, more modern and more daring, and that’s great for shows. But for competitions, for me, that is still a big no-no. The focus should be to recreate Elvis and not to reinterpret him. Q. What valuable life lessons did you learn from your parents, or mentor, that you still use today? A. Growing up, I was raised by two incredibly kind and considerate parents. I like to think that I became a kind human being for that reason. They taught me treat people with respect and, to this day, I have no tolerance for intolerance. Q. Do you have tattoos? Do you wish to share the meaning they have for you? A. Hahaha! I have so many that I can’t quite count them! I like to say that I only have one that takes up lots of space in several spots of my body! I have three Elvises, my wife Karen, my dogs, Helen Reddy, Paul McCartney, a leg tribute tattoo to the old TV game show “What’s My Line” (including Bennett Cerf, Arlene Francis, John Charles Daley and Dorothy Kilgallen), lots of Gary Taxali art, Bowie stuff… and there will be more! Q. Describe the highlights of your career. A. As an ETA, winning C’Wood non-pro in 2004 was HUGE for me. Making it to the three-man pro finals the year after that is right up there too. Q. What is the best part of being an entertainer? A. I think that it comes down to seeing people appreciate what we do, telling us their stories and connections to the artist we represent. More prosaically, singing is really fun! Q. Who are the important women in your life? Why are these women important to you? Marcus with his wife, Karen (left) and his dear friend, Wendy King. Photo Credit: C.M. Q. How are you different on stage, compared to off stage? A. Not very different at all, and that’s what made me realize that I could never be an ETA of the quality I would have liked to be. GREAT ETAs are so close to the real thing, in every way, that you can actually get lost in the illusion. I could never leave Marcus waiting in the wings and always brought my own personality on stage, to my detriment. Sure, it made for an okay, friendly show, but not Elvis-y at all. A. Funny you should ask that because I was just pondering the question a few days ago. For me, it’s almost a physical need…like being thirsty or being hungry. Last summer, we were vacationing in Florida for two weeks and halfway through the vacation, I had to run to Walmart and buy some paints and canvases because the “craving to paint” was so strong! As for actual visual inspiration, I love interesting faces. Q. What are the challenges of being an ETA competition judge? A. You have to know your stuff! That’s the main thing. You have to be an Elvis fan, not an ETA fan, and you have to never forget to be respectful to the guys. Not everyone is equal, but everyone benefits from constructive advice. I used to worry about whether I would be taken seriously as a judge. After all, so many ETAs I know have had stellar careers, been finalists at Ultimate, and I have not. But then I realized this: When you watch the Olympics and you see little gymnasts doing their thing, look at their trainers and coaches--middle-aged large guys who could not get on parallel bars if you paid them. But yet, they have the knowledge. So now, I see it that way. The fact that I can or can’t do something does not mean that I don’t know what NEEDS to be done! Oh, and in passing, judges need to be pretty thick-skinned because we get doubted and second-guessed (at best) a LOT. Q. What men have had a positive influence on your life? How? Marcus Wells at Flamboro Downs, March 16th, 2018. Photo Credit: C.M. A. My father (now gone for 25 years) taught me everything in the craft of being a good parent. He was a kind and loving man. I try every day to be like him. If, when I’m gone, my son Tommy thinks of me like I think of my own dad, I will know that I did a good job. Q. What makes you sad? How do you cope with sadness? A. The passage of time saddens me. I love life and I always look forward to the next adventure, but I have always had a big helping of nostalgia within me. Recently, on Facebook, someone posted: “Do you realize that one day, you went out to play with all your friends on the street and none of you realized that this was the last time you’d do it”. That had me in tears. I cope with sadness in the unhealthiest way possible: I squish it back down until I can’t feel it anymore. Q. What is your connection to Saatchi Art? A. Saatchi is one of the many avenues through which I try to sell some art. And they’re a pretty big name too! Unfortunately, I am realizing that selling art online is a super hard thing, and that selling art in person is not that hard at all! People have to see and touch art, with their eyes and hands, to fall in love with it. Q. Pick an art gallery or museum anywhere in the world where you would like to see your paintings on display. Why did you pick this particular gallery or museum? Victor J Hanson holding one of Marcus Wells' beautiful paintings of Elvis Presley. Photo Credit: Louis Young Photography. A. Well, this is a bit paradoxical because my favourite museum is dedicated to one artist only: the Andy Warhol Museum in Pittsburgh. I think my work would fit in terms of colour and style. I LOVE pop art! Now, I have had my work shown at the Neutra Museum in LA and that was a HUGE deal for me. I am absolutely gaga about mid-century architecture and design, which the Neutra specializes in! Having a piece at MOMA would be a crowning glory. Q. What are your strengths as a performer? A. I sing on key and I am self-deprecating – two things audiences seem to appreciate. Q. Besides Elvis, to what other famous entertainers do you pay tribute? Q. Describe your typical non-performance day. A. I keep a strange schedule – and always have as an adult. I usually get up at around noon and immediately start working. If work is under control, I will stop at around 7 pm, have dinner, and go paint. I go to bed at around 2 or 3 AM and treat myself to some movie time almost every night (big foreign movie and horror movie fan!) and I go to sleep at around 5 AM. A. My wife, of course. We spend ¾ of our lives with laugh cramps. She really knows how to strike my funny bone; and also, young people’s humour, memes. When the Internet happened, I realized that my particular sense of humour was much more common than I thought. Q. If it were possible, what would you like to ask Elvis? What would you say to him? A. I love the person that Elvis was in 1976-1977--flawed and human Elvis. Yet, he was searching for answers and seemed open to exploring different concepts of spirituality, life. I would have no questions, but I would have loved to chat with him at length and hear his take on many “life” things. As for saying things to him, I wish I could tell him how loved he is and how important he is (to this day!) and how he should have loved himself more. In the end, I think that Elvis was like so many of us entertainers are, deeply insecure; and I would love to find and say the right words to him to alleviate some of his pain. And of course, I would have a HUGE thank you in store for him for bringing into my life most of the people I so love. Q. What do you treasure? A. My posse of friends, my extended family. Marcus on his wedding day. Photo provided by M. Wells. Q. If you weren’t an artist, what career would you chose? Why? A. Well, I sing, I paint and I translate, three of my favourite things in the world! Time permitting, I would love to devote time to sculpting. Also, I am convinced that there is a book in me somewhere, just waiting to get out (but don’t we all). Q. What has surprised you most about the response to your art? A. It’s been well-received so far! I didn’t necessarily expect that. And now, I am slowly getting a foothold in the actual art world and this is such a source of awe! Imagine, if you admire an artist’s work and then tell you they like yours. It’s amazing! Q. Have you ever taught art? Would you want to teach art? A. Oh my goodness, no! I realized a few years back that I cannot teach anything. If I’m passionate about something, I talk about it with complete disregard for linear thinking; I just go on and on, take tangents and never get back to the original topic, throw in anecdotes regardless of the fact that they are uninteresting to others. I’d be a horrible teacher! Q. What process would you use to critique someone else’s art? A. To me, art is not meant to be critiqued. It’s meant to be appreciated and loved. I started a FB group called “Bowie Art and Artists”, and we now have over 1000 members, mostly artists, and people post their stuff everyday. Some of it is technically perfect, some less; but the reality is that all art comes from the heart and the soul, and, for me, you can’t criticize that. Q. What are sacrifices have you made for your career? A. I touched on this earlier, but I realized that my career as a translator (and now as a translator and a painter) would not let me be a full-time entertainer. Q. What is your favourite Elvis decade? Why? Marcus Wells...a dead ringer for Sir Elton John. Photo provided by M. Wells. Q. How may, Elvis and other, tribute costumes do you own? A. I used to have tons of Elvis costumes and gear, but gave most of it away. For Elton, I currently have 5 stage suits (but I want more!). A. As I’m getting older, I let less and less stuff bug me. Intolerance of any kind, however, grinds my gears more than a little. A. Death. All my life, I’ve feared death. I also fear the loss of autonomy and having to depend on others. Q. Describe a future that is specifically design for you. A. Oh…let’s dream a little. Karen by my side, my son Tommy secure and happy, doggos, health, my family and friends always around, working for pleasure, not because I have to, travelling like a mad man. Q. How do you handle disappointment? A. I learned a big lesson about that. One early-career year in Collingwood, I came in READY TO WIN. I had put forth so much effort for many months. I was so confident, that I had saved my “show-stopper” for the finals, so convinced was I that I would make it! And of course, because life is like that, I never made it past the first round. I was crushed. I holed up at Blue Mountain and cried all night. I remember saying, “I have never felt so crushed since my father’s death”. I was a complete mess. My (now ex) wife Victoria was amazing. She stayed up all night with me, trying to comfort me, and when the day came, she said, “Ok, now you go out there and be nice, and happy, and gracious, to people, even if you have to fake it”. I did that. My spirits were lifted and I instantly felt better. I’ve learned over the years that disappointments are just passing, so the best thing is to just dust yourself off, put on a smile and move on. Opportunities will ALWAYS follow and there will always me more ways to shine. So nowadays, I see disappointments as mere delays to something bigger and greater. Incidentally, my advice to all: WHATEVER HAPPENS, DO NOT BE A SORE LOSER! Q. How will you know when it is time to retire? A. For Elvis, who was such a young man when he died, well, I stopped when I realized that I could not possibly ever do him justice as much as I would like to. For Elton, it’s fair game! Q. What will you do in retirement? A. I have very ordinary dreams about retirement communities in Florida! Q. Who are the people you would like to thank for always being there for you through thick and thin? A. My wife Karen and her mom Audrey, Sue Harris and Wendy King--my angels on earth, my Gibbs, my Paul, my son Tommy, Victoria and Kenny, my family, my friends, and my other friends. I’m a very lucky man. Q. What famous artist, in music or art, alive or deceased, would you like to interview? A. Charles and Ray Eames (designers), Eero Saarinen (designer), Joan Crawford, David Bowie, Elvis, Paul Klee, Rothko. Q. What would people be surprised to learn about you? Marcus's monk. Photo provided by M. Wells. A. I have a life-like (but not life-sized) Buddhist monk statue in my house and it creeps out everyone. Also, I’m an ordained minister with the Universal Life Church. I can marry people, bless houses, baptize babies and stuff. Q. What would you like to say to the other performers with whom you share a stage during a show? A. I’m always grateful and excited. One of the things I love is being star struck when I first share the stage with someone new! Q. Other than Elvis, do you have a favourite singer? A. A few, yes! Helen Reddy, David Bowie, Kate Bush, Debby Boone. And I listen to classical music every day! My favourites are Bach and Chopin. Q. What question do you wish I had asked? A. I think that this was a very well-rounded interview! Q. What would be the answer to your question? A. That I couldn’t possibly think of anything more to say! Here are some great videos of Marcus Wells performing as Elvis and Elton John, including his wonderful performance at the Casablanca Winery in 2016.